Full of newness, full of possibility, full of...well, I'm not quite sure yet. It's too new. When faced with a new year I usually find myself wavering somewhere between a grab the new year by the horns (wait, are there horns?) feeling and a self-loathing pull the covers back over my head kind of feeling. Since it's still early, I'm optimistic and shooting for the former instead of the latter. How about you? 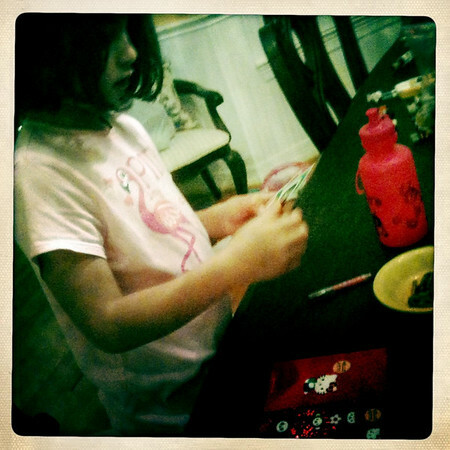 We welcomed 2011 in with a late afternoon lunch/early bird supper followed by a trip to HEB. I know, you are green with envy. But then we got really wild and played games. First there were a few rounds of Skip-Bo, followed by several exhilarating rounds of Uno. Annelise kept a running tally of our wins in her Hello Kitty notebook. She also kept her skates on (I worry she may become a modern day Tootie Fields type or a Sonic car hop) and would occasionally set her cards down for a quick skate around the stairs. 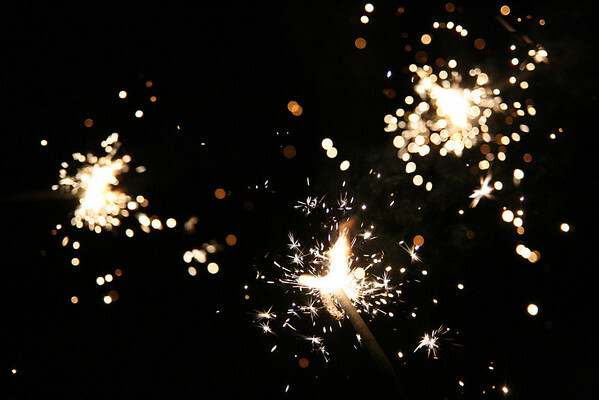 Since 8:30 is almost midnight we decided it was time to fire up our sparklers and shepherd in the New Year a little early. 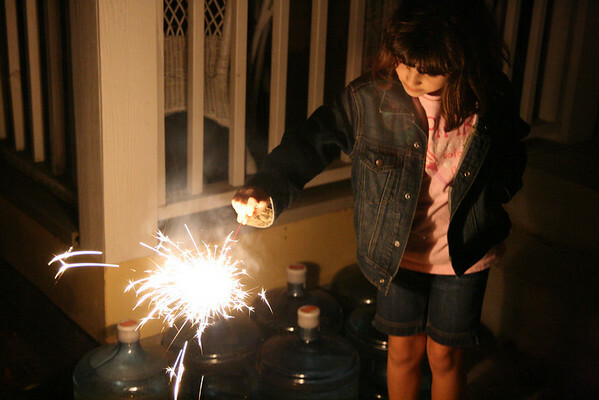 Annelise was a little hesitant this time for some reason (it's not like she's never held a small, flaming firework in her little hand before) and we practically had to force her to hold one. 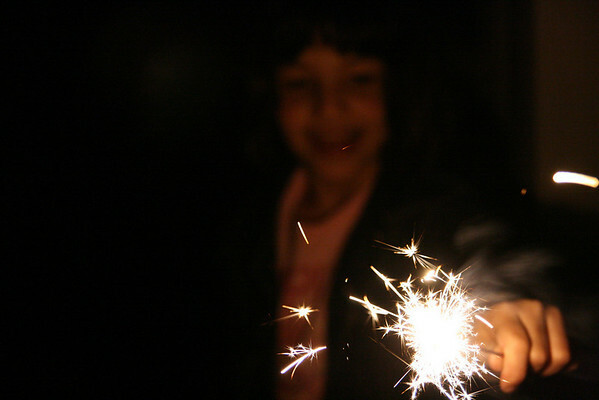 But she finally gave in and embraced the fiery stick of doom sparkler. And yes, she was wearing shorts and a jacket. It's Texas in December. After our exciting fireworks extravaganza, consisting of six sparklers, we finished up the night with a game of Rummi-Kub. Have you ever played it? It's like the card game Gin Rummy (why is it called gin rummy? Are you supposed to drink gin while playing? ), but played with tiles like dominoes. It's fun, trust me, but can take a while to play. Off-track but loosely related side note: I can't help but think of my Aunt Bernice (AKA Aunt Bernie) who was my grandmother Sue's sister. When I was 12 or 13ish my mom, dad and I went up to visit them in Centerville so my dad could (he hoped) kill an innocent deer. Or maybe it was birds. I can't remember. I do remember Aunt Bernie teaching us to play Rummi-Kub and subsequently playing the entire weekend. And it was Aunt Bernie who gave me my first taste of hard liquor. Yep, she did. But it was purely medicinal because a Hot Toddy (which I think was warmed up whiskey and honey or something) was her sure fire remedy for cramps. Maybe I was ever so slightly tipsy, at 12 or 13, on my medicinal Hot Toddy, but I felt remarkably better and thought Rummi-Kub was the best game ever. And that, my friends, was our rollicking New Year's Eve. 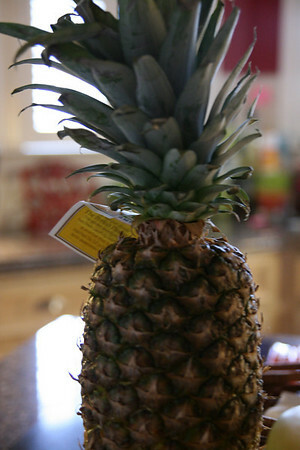 So I, along with my symbol of hospitality, the prickly pineapple, welcome 2011, whatever it may bring. We play rummi kub- but your aunt's version... wow! Happy New Year. And I am the Rummi Kub Queen around these parts. Unbeaten for several months running. 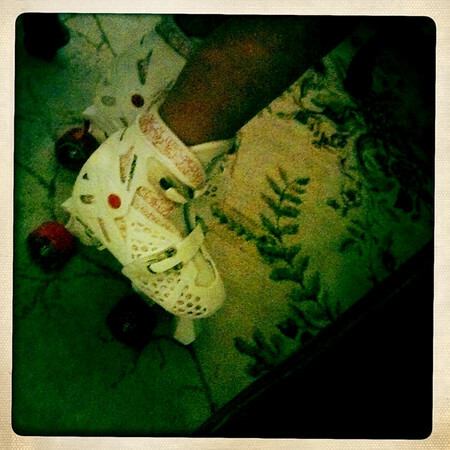 Hey, the Sonic car hops on skates make the best tips, so Annelise is smart to be training now. Maybe you should get her a tray to carry every now and again and then have her bring you drinks from the fridge. Ha. I went to bed at 9:22 on New Year's Eve and was fine with it. Happy New Year! We rang it in in similar fashion, only Jack crashed at 11:30 and could not be roused at midnight for love nor money. Hope its a great year for you and your family! so that is the cure for cramps!! there are days that I think that might be the only thing that would cure it for me! I hear you silken! ha! Holly, that story about made me fall out of my chair I was laughing so hard. What a HOOT! I have to laugh out loud with the rest about the "Totty"! You have the best stories...keep sharing! I love Rummi-Kub! It is so fun. We spent our NYE playing the Wii and eating junky food. Kids went to bed around 10:00 and we just managed to stay up until 12:10 or so. Happy new year! LOVING your little Tootie. That cracks me up!